Despite adverse weather conditions, a good number of employees from different companies within Vassallo Group participated in the yearly traditional corporate social responsibility event which was held at Dar tal Kleru, a retirement and care home for priests. This home has been in operation for over 50 years and currently cares for around 50 residents. Every year Vassallo Group chooses to help an organisation by supporting a particular project. This year the group decided to support this worthy project in appreciation to the years of service provided to the community by those who are now residing there. 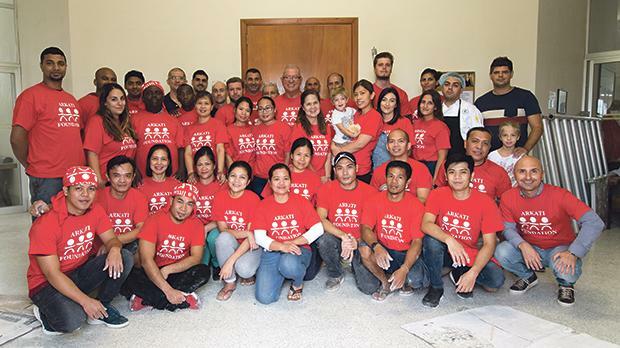 Employees were divided into three main groups to help with jobs in construction, kitchen and cleaning. Construction jobs included the fixing of concrete slabs, alterations and gypsum work in various rooms as well as painting of rooms and doors. A number of employees were assigned kitchen duties, in addition to a CaterEssence chef who took care of the production of Maltese krustini for all the priests, staff and volunteers. The rest of the team took care of the disposal of unwanted goods and cleaning of the premises. On the same occasion a senior manager from CareMalta, Paul Pace, provided a training session in customer care to the residence’s members of staff. Group chairman Nazzareno Vassallo was present for the entire morning, supporting this event and showing his appreciation to each and every volunteer. CaterEssence also provided a variety of food items to all participants.